Wireless RGB/multicolor controller with RF remote. Up to 100yards range thru walls. Auto-on feature will automatically turn on the controller every time power is connected. Great feature if controller is connected to a switched outlet or timer. Everytime the outlet turns on, the controller will remember that last color/mode. It includes CYRON part# HTHUB6 for plug-n-play ability of all CYRON Media Highlighter lightbars. Add additional HTHUB6 for more lightbars. 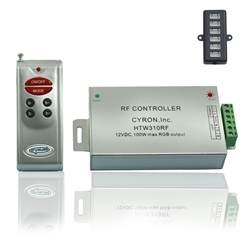 All HTHUB6 placed with HTW310RF will be pre-wired prior to shipping. Auto-on feature when powered up by timers, etc.